Hackney has invited developers and others to lodge, by 19th June, "expressions of interest" in its Grade II listed Haggerston Baths. Included is the former 100' by 30' public swimming pool which controversially closed 15 years ago. Hackney's agents BNP Parisbas has described the offer of a 250 year lease as an "outstanding opportunity" in an increasingly desirable location. 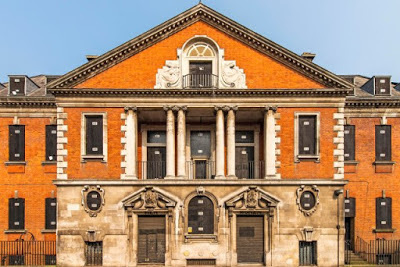 The Wren Revival style building was designed by Alfred Cross and built for Shoreditch Borough Council in 1904 at a cost of £60,000. Internal modernisations were carried out in 1960 and it was Grade II Listed by English Heritage in 1988. The Haggerston Baths were planned at a time of cholera and smallpox outbreaks locally when three families would share one house and "scarcely one" house had its own bath, It was hoped at the time that promoting cleanliness would also "raise the moral tone" of the working classes. The building had 1st and 2nd Class Slipper Baths, as well as a public laundry ,where the local residents could wash their clothes as well as themselves. Opening day in 1904.The amphitheatre style raked seating was more recently removed. 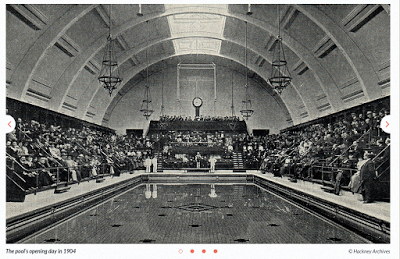 The pool hall, with its magnificent roof, was built both for swimming and as a public hall. Boxing matches, dances and other events were held there. 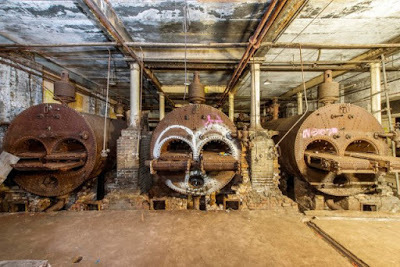 Internally, there are three original 28' Lancashire boilers in the basement but, following the 1960s modernisations, only the 2nd Class Women's slipper baths now remain ( Bring your own soap -Ed.). 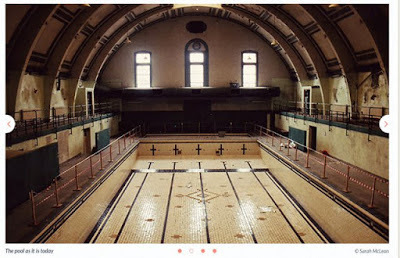 The Save Haggerston Pool Campaign reported that as recently as May 2014 Hackney's Mayor Pipe stated "The problem with Haggerston Pool is not that it is about to be put up for sale, which it is not, rather that any owner is faced with finding in excess of £25million to invest in refurbishment, redevelopment of the west wing, and restoration of the pool and hall". Following the recent advertisement the Mayor stated "unfortunately, with ever- shrinking resources, we simply cannot prioritise this project. We will only consider working with an appropriate partner, such as someone who is prepared to use the building for the benefit of the community or to revitalise the local area". Sadly. since the building was closed 15 years ago, it has suffered ongoing damage and vandalism. 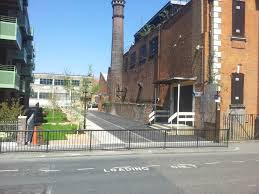 The Victorian Society has expressed concern that, unless investment is urgently made, the building could be lost for public use if not entirely. The Save Haggerston Pool Campaign have called for a public meeting, to discuss the bids which Hackney have received and to consider whether adequate community benefit would be achieved by the redevelopment proposals.